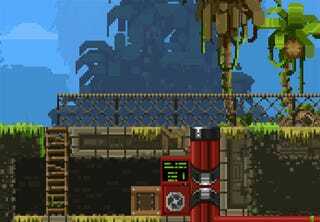 At first glance, Broforce looks like just another Metal Slug tribute. And in some ways, it is. Those looking for a fast side-scrolling game where you do nothing but shoot things will be well catered for. But that's not what I'm enjoying most about Broforce. Nor is it the humour, though this is a funny game. There's comedic charm to the bad guys, and everything is so relentlessly over-the-top it can't help but bring a smile to your face. No, what I like best is how smart this game is under all the Broness. Each stage you play is short. Very short. They're designed not for you to, ahem, slug your way through, but to blast through as quickly and explosively as possible, leaving rubble (terrain is destructible) and blood in your wake. You're judged on speed and kills. It's hard doing both well, since stopping to kill everyone takes time. Making things interesting is that with every caged prisoner you free (again, hi Metal Slug! ), you automatically change characters. And what a roster of characters they are, including (but not limited to, since they're adding new ones all the time): Rambo, John Matrix, John McClane, B A Baracus, Ash, Ripley, Conan, Macgyver (! ), Walker: Texas Ranger (!!) and...Blade (?). Each has their own weapon, strength and weakness, meaning each one will make you tackle a level slightly differently. Blade, for example, can only melee. John Matrix has the best weapon (a giant rocket launcher) but it has a slow reload. Macgyver can throw dynamite that sticks to bad guys, making him maybe the toughest to use, but also the funniest. The fact you can smash the terrain makes every stage an exercise in replayability and experimentation. The obvious route to the end-of-level escape chopper (of course) is never the fastest; normally you'll need to blow some holes in the walls, or ignite a strategically-placed gas cannister (which you can also ride) that smashes an entire section of mountainside into nothingness. Then, once you've nailed the fastest route, you can go back and work out how to do that while also killing as many things as possible. Oh, and did I mention it supports up to four players at once? Four players locally, on the same computer? Yeah, it does, and it's awesome. From the roster to the music to the way the game plays out in short, explosive bouts, Broforce is basically a playable collection of 80s action movie moneyshots. Broforce is still in early access, which is why this isn't a more formal review, but at $15, I like this game. If you want to try it out first, there's a demo available to play here. You can buy (well, technically pre-order) the game from its official site and Steam.